KB Ethos Women's Fitted Baseball Beaded Adjustable Hat. Premium Head-wear. 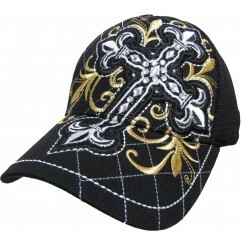 Bling Hat with Cross Embellishments. Hat color in Black with Black net back.